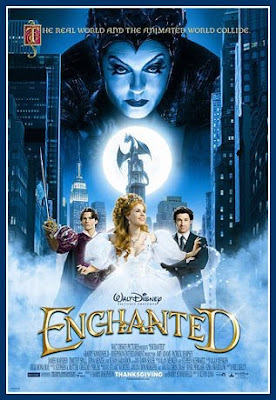 The movie Enchanted directed by Kevin Lima, the film stars Amy Adams, Patrick Dempsey. This is actually the last movie I saw on the cinema on December, 2007. I was six months pregnant with Jake then and it was snowing. Hubby didn't want to watch it because for him movies like this are gay, corny, not real but I wanted to watch it and I would watch it with or with out him. Eventually, I won with the arguments and he watched the movie with me. Inside the movie house there were couple of little girls with their mom watching the movie. I was fascinated with the movie that I was grinning ear to ear and hubby just laughed at me because I looked like a little girl. I like fantasy, fairytale movie coz despite of all the problems watching movie like this it makes me forget my worries and a stress reliever as well. A classic Disney fairytale collides with modern-day New York City in a story about a fairytale princess from the past who is thrust into present-day by an evil queen. Soon after her arrival, Princess Giselle begins to change her views on life and love after meeting a handsome lawyer. Some of the scene in this movie can also be compared to other fairy tale we've seen and fantasize when we were little such as Beauty and Beast, Little Mermaid, Snow White, Cinderella and more. To join the Tuesday Couch Potatoes just head over to Kikamz blog; host of this meme or click the badge above and you can check out other movie enthusiast and leave a comment or two. nice. i put myself into the character everytime i watch disney movies. it is really enchanting. havent seen this one yet~! Di ko pa to napanood bakla, mahina ako sa mga cartoon shows eh.. saka we grew up without a TV kaya huli sa balita ang lola mo lol..
Hahah husbands are powerless over fairytales! When I was married I watched kahit ayaw ng hubster. I just made sure I was holding the car key lol! Thanks for your entry. I saw this many times in the DVD shops but didn't think of buying. I would have forgotten this already if you didn't post it. yeah. this is a cute and funny movie! super kilig ako sa film nato and my darly enjoyed watching it as well. haaaay, makes you dream about your prince charming who's sitting right next to you. So that is Enchanted. And McDreamy is there! Now I am so going to watch it na. Hehe! It's good to know that your hubby went with you anyway even if he is not into fairytales. sabi pa nila, "Pagbigyan daw ang buntis". thanks for joining this week Mommy Shy, and my apologies for the very late comment. hope to see you again next week for a robot/cyborg movie. hugs! Waaah! i duno the story... I haven't watched it but i am sure going to find the movie and the time to watch it... haha!